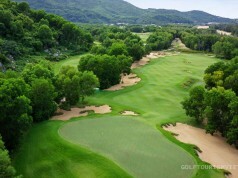 The IMG-managed Ba Na Hills Golf Club set at the foothills and native forests of the well-known Ba Na Hills – a French hill station in colonial times where is a pleasant 25 minute from Da Nang International Airport and Da Nang, Vietnam’s 4th largest city. This stunning property is set among some of the most impressive mountain ranges in the region, the golf course and the residential project being developed by Sun Group are expected to be the Central Coast’s New Golf Destination. Designed by Luky Donald – former No.1 English professional golfer who has joined IMG in the design of the first 18 holes at Ba Na Hills Golf Club. 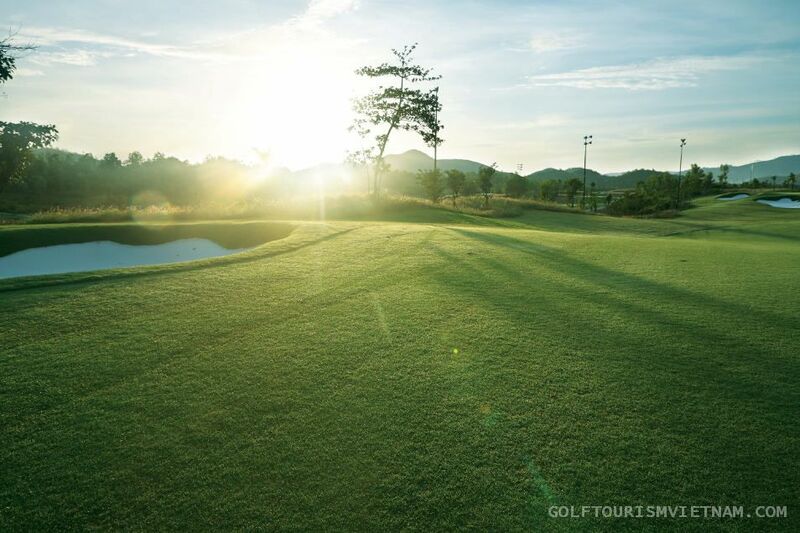 “To be able to work on my first ever golf course design at Ba Na Hills is a tremendous opportunity. We have a great site with good elevation change and incredible existing natural features including large trees, streams and mountain backdrops”. Says Luke. The course is a mountain course with a diverse mix of natural topography and vegetation. Every hole and vantage point is framed by a beautiful backdrop of local native forest. The entire course is lit from the first tee until the 18th green, allowing patrons the unique experience of playing golf after dark. This 18-hole Championship golf course set amongst gently rolling hills, at 7,595 yards from the professional tees par-72 provides a balance of challenge, enjoyment and excitement to golfers of all levels and abilities. The front 9 is somewhat more traditional forest/parkland in style, while the back 9 wends its way through twists and turns of the surrounding hillside. Multiple tees, angled greens, strategic bunkering, and the relationship of water to playing areas provides variety and balance. The Ba Na Hills Golf Club PGA Academy offers state of the art technology including Trackman 4 the worlds most advanced and newest premium radar featuring Dual Radar technology, all combined with a holistic teaching philosophy to ensure rapid improvement and importantly enjoyment and total comprehension of the game is attained by all levels of golfing experience from beginners to elite amateurs alike. The Ba Na Hills Golf Club offers well equipped, luxurious facilities and is also ideal for weddings, conferences, meetings, dinners, special occasions and events. By any measure, Ba Na Hills Golf Club is a once in a lifetime opportunity to enjoy golf at its very best. The Ba Na Golf Club is about 4,500 feet above sea level and the entire Ba Na tourist complex serves as a much welcomed cool hill resort from the very hot weather of downtown Danang. Address: An Son, Hoa Ninh, Hoa Vang Ward, Da Nang City, Vietnam. Can you please sign me up for the news letter and the Ba Na Hills golf course looks so beautiful. 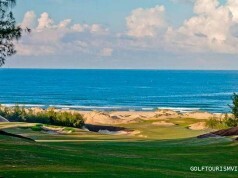 I intend to visit Danang in the near future and will definitely play a round of golf on your great looking course. 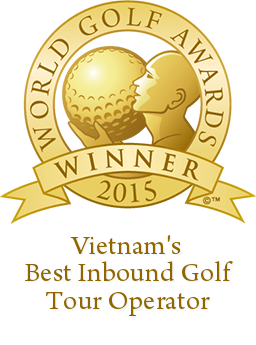 Thank you for your comment and please leave your email address so we can update you with news & updated price for golf booking, golf tour in Vietnam. 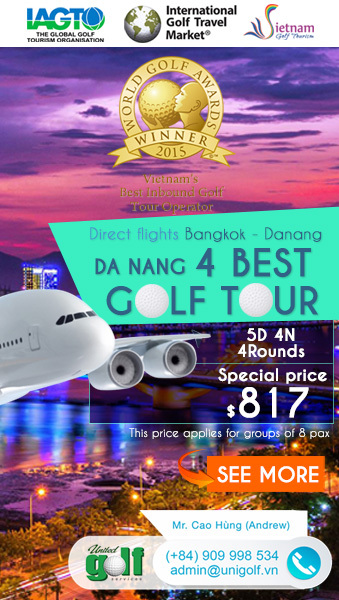 When you want to play at Da Nang drop us an email to sales@golftourismvietnam.com , we will provide golf booking and also a full package (with hotel + transportation + golf fee) for you. Da Nang and nearby area also have 3 other best & famous golf courses : Da Nang Golf Club – Greg Norman, Montgomerie Links – Colin Montgomerie , Laguna Lang Co – Nick Faldo to complete your golf holiday in Da Nang, Vietnam.